On Saturday, I was fortunate to be invited to Knecht’s Nurseries and Landscaping in Northfield for a special visit of the Rochester-based Shades of Green Hosta Society. 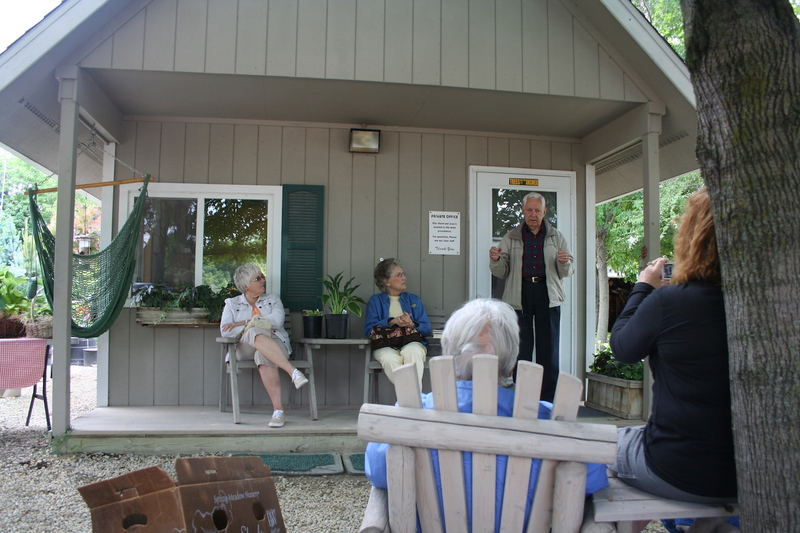 These dedicated hosta enthusiasts were on a bus tour that included a visit to Leif and Deb Knecht’s garden and a chance to meet Northfield resident Jerry Williams, the man who discovered and named ‘Praying Hands’ hosta, the 2011 Hosta of the Year. Before his talk, I chatted with Jerry, a delightful almost 84-year-old, and he told me how he discovered ‘Praying Hands’. Hostas are interesting because while breeders have done much to create new hosta cultivars, the plants themselves often put out what are called “sports,” new naturally occurring variations, and much discovery and development of hostas has been done by enthusiastic and knowledgeable amateurs. Praying Hands hosta has a distinctive leaf curl. Jerry and his late wife Lorraine had a home on Lake Hubert in northern Minnesota, which included almost 3 acres of wooded land and, while they had not been gardeners before, the couple decided to plant the area with hostas. (Eventually they would have about 300 varieties.) Sometime in the late 1980s, they visited a nursery in Pequot Lakes. Mn. 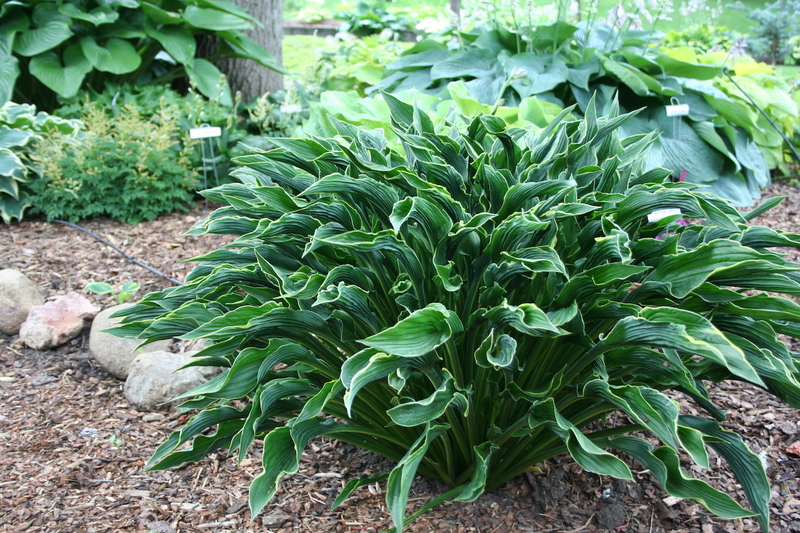 At the back of the nursery, Jerry spotted one unusual hosta with bright green, narrow, twisted leaves, edged in yellow. The plant had no tag and when he asked the nursery owner, “What’s this?,” the owner didn’t know. “How much?” Jerry asked. “$3.95.” Sold! Jerry planted it in his gardens at the lake and tried to find the plant in various hosta references, but it was never listed. Later, he gave a division to each of his two daughters, just to make sure the hosta lived on in case he lost his plant. As time went on, Jerry became more interested in hostas and in 1994, he took a division of the plant to the Minnesota Hosta Society meeting. He put it down in front of two of Minnesota’s premier hosta experts — the late Ken Anderson and Hideko Gowan. Both said they had never seen the plant and suggested Jerry name it and register it (kind of like a patent for hostas). Naming a hosta is an important step, since many hosta enthusiasts choose plants based in part on their names. It was Jerry’s eldest daughter who suggested ‘Praying Hands’, saying that the plant’s twisted, upright leaves reminded her of Albrecht Durer’s famous painting of his brother’s hands in prayer. Jerry continued to mostly give the plant away to fellow hosta lovers, but in 1996, one of his friends won first prize at the Midwest Regional Hosta Society Convention with ‘Praying Hands’. Jerry Williams told the Shades of Green Hosta Club about his discovery. Eventually, the plant came on the market, and its popularity grew, culminating in being named Hosta of the Year, which designates the plant as being not only beautiful, but hardy and reliable. A few years ago, Jerry’s wife died. He later married her twin sister, Florraine, and they moved to a town home in Northfield. (They met playing in the St. Olaf College band in the 1940s.) While he does not garden any more, Jerry loves to visit with gardeners and talk about his hosta. Jerry believes that because the nursery where he found ‘Praying Hands’ carried only common hostas, it’s most likely that ‘Praying Hands’ was a result of bee-pollination, rather than being a natural sport. While there is no way to prove it, Jerry believes the parent plants are most likely Hosta fortuneii aureomarginata and Hosta lancifolia. « Do You Say, Pee-O-Nay? What an interesting hosta. I cannot even think about having hostas. Deer! And no fence the way Mike Shadrack has. I just found some of these at my local nursery! I am in love! It’s wonderful! Thanks for telling the story about it’s discovery.